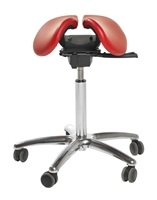 Premium saddle stool for demanding active tasks. Anatomical split-seat with adjustable center gap opening. Adjustable seat tilt. Seat height options for short, average, and tall users. Compatible with Salli accessory arms and back. The budget version of the Salli Multiadjuster. Anatomical split-seat with adjustable center gap opening and seat tilt. Seat height options for short, average, and tall users. Compatible with Salli accessory arms and back. The budget version of the Salli Swing Saddle Chair. 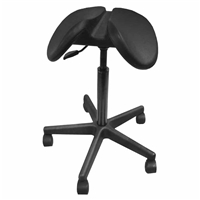 Saddle seat rocks and tilts, following the body's natural movements to reduce postural strain. Anatomical split-seat design. 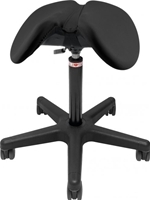 Budget version of the premium Salli SwingFit saddle stool. Excels at demanding active tasks. Anatomical split-seat with adjustable center gap opening. 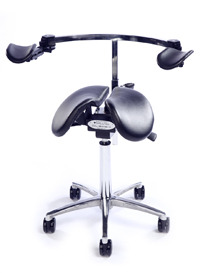 Saddle rocks and tilts, following the body's natural movements to reduce postural strain. Seat height options for short, average and tall users. The budget version of the Salli Twin Saddle Chair. 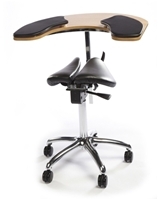 Anatomical split-seat design improves posture and eases sitting pressures while you work. Seat height options for short, average, and tall users. 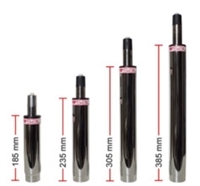 Compatible with Salli accessory arms. Protect your Salli chair in demanding environments with a custom-fit slip cover. Available in leather, synthetic suede, 100%cotton, water-resistant and fire-block materials. 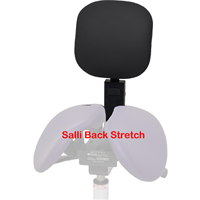 Salli offers a variety of arm support accessories. 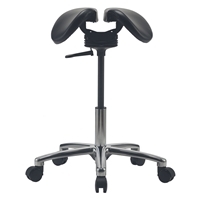 While the need for arm support is less when you use a saddle seat compared with a conventional chair, arm support can still be useful, especially for prolonged tasks and precision work.